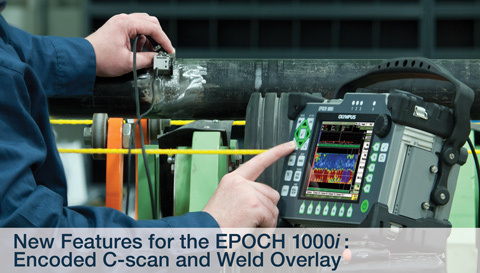 The EPOCH 1000 is an advanced conventional ultrasonic flaw detector that can be upgraded with phased array imaging at an authorized Olympus service center. Key features include: EN12668-1 compliant, 37 digital receiver filter selections, and 6 kHz pulse repetition rate for high speed scanning. 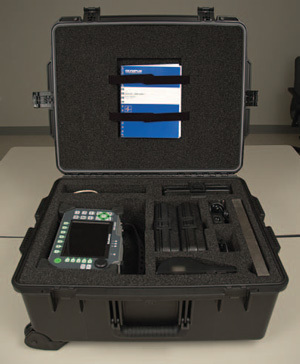 The EPOCH 1000 Series Digital Ultrasonic Flaw Detectors combines the highest level of performance for conventional portable flaw detection with the power of phased array imaging. The EPOCH 1000, 1000iR and 1000i feature a new horizontal case style with full VGA display, knob and navigation arrows for parameter adjustment, and full EN12668‑1 compliance. The advanced conventional ultrasonic functionality of the EPOCH 1000 series is augmented in the EPOCH 1000i with phased array imaging capabilities. 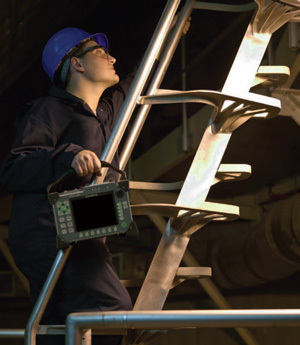 Three instrument configuration levels to suit many inspection needs. The EPOCH® 1000 is an advanced conventional ultrasonic flaw detector that can be upgraded with phased array imaging at an authorized Olympus service center. 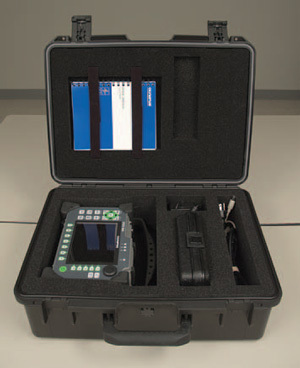 The EPOCH 1000iR provides the same ultrasonic flaw detection capabilities as the EPOCH 1000 with the benefit of upgrading to phased array with simple field-remote activation. The EPOCH 1000i comes standard with the same advanced ultrasonic flaw detection capabilities as the EPOCH 1000, with the addition of a built-in phased array imaging package. Large, full VGA (640x480) resolution color transflective display for optimum viewing in low or bright lighting conditions. Rugged rubber handle for easy transport. Durable instrument-mounted D-rings for chest harness use. Front and rear stands for table-top or steep inclined viewing. USB Client and Host ports for PC communication, direct printing and communication with peripheral devices. 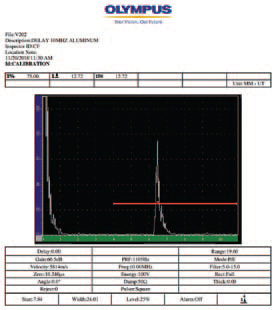 VGA output for presentations, training, and remote instrument monitoring. Programmable analog outputs, alarm outputs, and RS-232 communication. Standard internal, rechargeable lithium-ion battery. The EPOCH 1000 series is equipped with onboard capabilities for file and database transfers, image capture, and basic reporting. These features provide you with multiple options for accessing previously stored data, in addition to live images. Two forms of removable media, compact flash (CF) cards and USB memory sticks, can be used to export of images and reports. A compact flash (CF) card is included with every EPOCH 1000 series instrument. The sophisticated data logger is designed for easy data capture for reporting of images, measurements, and calibration information. The data logger features dedicated calibration files with quick recall capability for fast setup adjustment, in addition to inspections files with either full data or basic image and measurement captures for quick reporting purposes. Advanced file types are also available for a variety of corrosion applications. The complete instrument database can be backed up to a USB memory stick and restored onto any EPOCH 1000 series unit. Individual files can also be copied to a USB memory stick for transfer between units. Screen shots of the live instrument screen can be captured and exported using either removable media format (CF or USB). Specific file types can also be created to allow for easy export of the saved file image for use in any kind of report. The enhanced reporting capabilities of the EPOCH 1000 series enable dynamic output of information in a variety of formats. Reports from stored data files can be created onboard the instrument and sent to the desired media destination (CF or USB) in HTML format. Two report options are available based on the specific information required for the report. A custom logo can be imported and used in place of the standard Olympus logo in the report header. The EPOCH 1000 series is fully compatible with GageView Pro Olympus' standard portable instrument PC interface program. 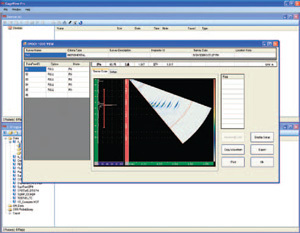 The GageView Pro interface program can be used to download saved data for review, export, and backup, and to generate reports containing setup parameters, measurement data, and waveforms. Database backup files can be viewed directly in GageView Pro using a USB memory stick without having to connect the EPOCH 1000 series instrument to the PC. This feature allows for backup, data review, and report generation of instrument files without having to remove the instrument from in-field work. Other tools, including an instrument firmware upgrade utility, are also available as part of this program. Download saved inspection data and setup files. Review setup information and measurements on a PC. Export measurements and calibration data to common spreadsheet programs. Back up calibration and inspection data from the instrument. Generate reports with setup parameters, measurements, and waveforms. Access saved data through unit database backup files. The EPOCH 1000 series offers various accessories to allow full functionality of available features.